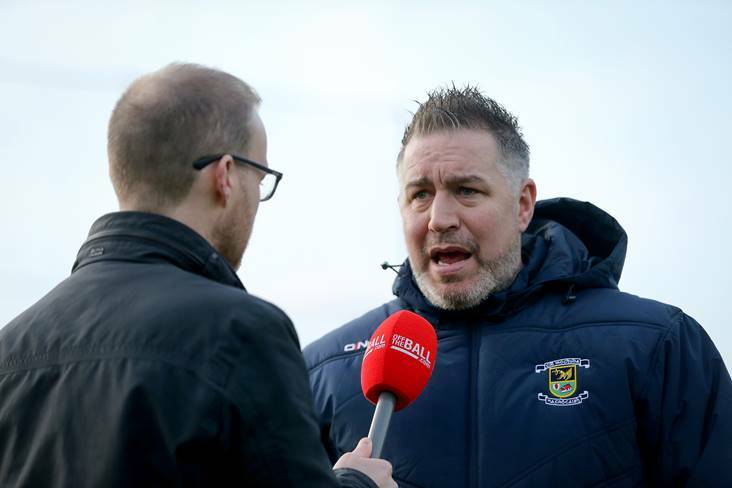 "It's worked from a Dublin point of view in relation to the lads being released"
Kilmacud Crokes manager Johnny Magee being interviewed by Off The Ball. There have been no issues in Dublin with regard to county players being released to their clubs, according to Kilmacud Crokes manager Johnny Magee. Sky Blue star Paul Mannion caught the eye as Magee guided the Stillorgan outfit to a 3-12 to 1-11 Dublin SFC round 1 victory over south Dublin rivals Ballyboden St Enda's yesterday. Shortly after the final whistle, the former Wicklow manager told Off The Ball: "It's worked from a Dublin point of view in relation to the lads being released. "Jim [Gavin] was releasing lads to all their clubs for the period of April. But I know there are other counties who haven't released their players to train but have allowed them to play league games. "For me you need two separate seasons where you define the season; play your county season and then play your club season. "We need to sit around a table and thrash whatever is out - I don't think that has really happened yet. It's definitely going to affect the so-called weaker counties or clubs that mightn't have the population to deal with one of their better players going to play for their county. "A lot of clubs need their best players playing. And if you have a club where one or two county players, and they have a small pool to pick from, it's very difficult."